Takao: Kuroko no Basuke Special CD featuring Takao Kazunari. Midorima: It is Tuesday afternoon. Takao: Man, why’re we having art class outside when the weather’s this nice? Ugh, all I wanna do is kick back and relax… [lies down] Huh? Hey, that’s kind of amazing, Shin-chan. Takao: We’re doing oil painting, right? Takao: Oil painting is pretty old-school, ain’t it? Takao: But yours looks way too neat to be an oil painting! Like, this building looks like it came straight out of a photograph! Midorima: Is that a problem? Takao: I guess not, but, I dunno, doesn’t that defeat the whole purpose of doing oil painting? Midorima: There are various types of oil paintings. Takao: But isn’t “freedom of expression” supposed to be one of the merits of oil painting or something? Oh. By the way, Shin-chan, what’s your lucky item today? Takao: Um, wow. Where on earth did you buy that? Midorima: Hn. You just have to know where to look. At any rate, Takao, are you going to be alright? Midorima: Scorpio is ranked eighth today. Takao: I’m fine, really! No worries. [a bird lands on his artwork] Ah. [the bird flies away] I had just finished painting the sky, too! Midorima: Those look like bird droppings. See? It’s just as “Oha Asa” predicted! Takao: What am I gonna do? Takao: Thanks! [tries to salvage his painting] Ugh. Man, this is bad! Midorima: What are you doing? Midorima: We don’t have much time left. Takao: Even if I did manage to clean it off, I wouldn’t have time to finish the painting… Alright. If it won’t come off, then I’ll just blend it in! Midorima: Why would there be pink in a blue sky? Takao: Freedom of expression is critical, here! Heheh… [painting] Look! It turned out pretty nice, don’t ya think? Actually, I think it might look even better than it did before! Midorima: It is now Wednesday. Takao: Oh, Shin-chan—pffft! What the heck is that? Takao: No, of course I do, but—I’ve only ever seen little tiny ones that stick their beaks into cups of water! That thing’s gotta be at least a meter tall! Midorima: I found it in a privately owned general store in Yokohama. It’s truly one of a kind. Takao: But Cancer is ranked fourth today! Don’t you think you’re going a little overboard? Midorima: It might be large, but it can still drink water. Would you like to see? Takao: [laughing] Nah, that’s alright. I’m having plenty of fun just watching you lug that thing around. Midorima: What is that supposed to mean? Anyway, that’s enough about me. Your situation is far more pressing at the moment. Midorima: Scorpio is ranked tenth today. Takao: Oh yeah? Well, it’ll work out. Besides, I only started looking at horoscopes after I met you, Shin-chan. But I managed to make it this far through life without knowing the daily rankings, y’know? Midorima: Had you known, you might’ve had better luck. Perhaps yesterday’s oil painting incident could have been avoided. Takao: Oh, the pigeon crap, right? Actually, I forgot to tell you, but the art teacher was super impressed with the way it turned out! [imitating the teacher] “The sky in particular looks incredibly realistic. Your personality really shows in this piece. Good work.” That’s what he said! And the whole time he was talking, he was pointing his finger where I had mixed in the pigeon crap! I almost died trying not to laugh! Midorima: He liked that pinkish blue sky? Takao: Yeah, so don’t worry about it. Everything’s fine and dandy now. Midorima: That was a very near miss. Look, Takao! The drinking bird took the hit and stopped the ball! There is no doubt that this is my lucky item! Takao: [struggling to his feet] Ouch…! Yeah, but then it tipped over and clocked me in the head! And I was the one who noticed the ball in the first place! Midorima: If you had a lucky item of your own, things like this wouldn’t happen. Takao: Wow, that was close. Now we’ve got falling flowerpots? Geez, we’re getting attacked from all sides. Anyway, what is this thing? Midorima: Can’t you tell? It’s a magnifying glass. Takao: Heheh. [laughing] No, I know that, but—I haven’t had one of these since I was in elementary school! Oh, that’s right! We used to use them to focus sunlight and burn paper and stuff. Man, this really takes me back! Midorima: I think we’re done here. We’re going back to the classroom. Takao: Roger that. Let’s go! Midorima: It is now Thursday. Kuroko: Hm? [picks up the phone] Hello? Kuroko: It’s unusual for you to call me, Midorima-kun. Midorima: Do you remember a novel we read in middle school called Me, Her, and the Dog? Kuroko: Of course. It’s a masterpiece. I still reread it every once in a while. Midorima: Does that mean you own a copy? Midorima: I’ll be right over. Kuroko: I don’t mind lending it to you, but…this is really sudden. Midorima: I want to read it today, no matter what. Kuroko: Then would you like to meet up after practice? Midorima: No, that won’t do. Kuroko: What is the real reason you want it? Kuroko: I thought today’s lucky item for Cancers was a dozen pineapples. Kuroko: What sign is Takao-kun, again? Kuroko: Is this his lucky item? Kuroko: Understood. I’ll have it ready for you. Takao: Hahahahahaha! Hahahahaha! [laughing] What, so you went and borrowed this book from Kuroko first thing this morning?! Midorima: I simply happened to remember that he owned a copy. Here, take it. Takao: [laughing] I told you, I’m fine! Midorima: If it weren’t for the magnifying glass yesterday, you would have taken a direct hit from the flowerpot. Takao: Ah! So that thing you had yesterday…was my lucky item? But you know, I’ve always been lucky when it counts, so I usually scrape by somehow. Midorima: Nevertheless, Scorpio is ranked tenth today. This string of bad luck has gone on for far too long. Takao: [sighs] Well, I guess you did swallow your pride and beg Kuroko to let you borrow the book. I might as well accept it. Midorima: I did not “beg” him to let me borrow it. Takao: [takes the book] Me, Her, and the Dog… [perusing the book] Is it any good? Midorima: The main character and the heroine turn into dogs, but once they have finally come to terms with living their lives as dogs, they turn back into humans—meaning that the ending is neither happy nor unhappy but is truly bittersweet. That’s what the novel is about. Midorima: It is now Friday. Midorima: Are you alright, Takao? Takao: Yeah, sorry. After I started coughing yesterday, I realized that it’s been a long time since I’ve had to go to the infirmary. Midorima: How are you feeling? Takao: [sighs] I never thought I’d take a turn for the worse right in the middle of practice… They said it’s probably a cold. Well, I think I’m done coughing for the moment, at least. Midorima: This is Furimukazaru. In the 1930s during the Showa era, about forty of them appeared on the market in Yamanashi. It’s a very rare item. Takao: Shin-chan, I appreciate the thought, but I’m fine, honestly, so would you stop going to such great lengths on my account? Midorima: It’s not a problem. Takao: I’m almost afraid to ask, but how much did this cost? Takao: Fifty thousand?! I know you did it for me, but could you please stop wasting that kind of cash on monkeys?! Midorima: This is a necessary part of doing everything in my power. Takao: Heh… Yeah? [stretches and climbs out of the bed] I think I’m feeling better now, so let’s head home. Midorima: Just for today…if you like…you can sit in the back of the rear car…without winning at rock-paper-scissors. Takao: What?! WHAT?! Wha—Shin-chan, does that mean you’re gonna ride the bike?! Midorima: I highly doubt you should be riding a bike in your condition. Takao: Uhhh… Nope! Let’s leave the bike and the rear car here and just walk home today! Midorima: Why? I said I would give you a ride. Takao: ‘Cause I feel like stretching my legs a little bit! Midorima: You had better not overdo it. Takao: I won’t, I swear! But thanks for worrying about me. Midorima: I did nothing of the sort. If something were to happen to you, it would cause problems for the team. Takao: Yeah, yeah. Alright, let’s go! Midorima: It is now Saturday. Midorima: I apologize for bothering you again. Midorima: Thank you for your help the other day. Kuroko: I’m glad everything worked out. May I ask why you’re calling? Midorima: Right. Are you familiar with the sequel of Me, Her, and the Dog? Kuroko: Yes. It’s called Me, the Dog, and the Ring. Midorima: I need to borrow it. Midorima: If you own the first book, then you must own the sequel. I need to borrow it. Kuroko: I don’t have it. Kuroko: I don’t have it. I don’t own a copy. Kuroko: Yes. I borrowed it from the library to read it once, a long time ago. Midorima: … It seems to be even rarer than the first book… I’m having trouble finding a copy. Kuroko: I had wanted to collect the whole series, but before I knew it, the books were out of print. Do you need it that badly? Midorima: That book is today’s lucky item. I only need it for the day. Kuroko: I thought today’s lucky item for Cancers was a cuckoo clock. Kuroko: So it’s for Takao-kun? Midorima: Yes, so what of it?! Kuroko: In that case, I know someone who owns a copy. Kuroko: I believe she owns the entire series. Midorima: I need you to introduce us! Kuroko: I’m not sure if she’ll lend it to you, though. Midorima: It doesn’t matter! I just need you to explain the situation! 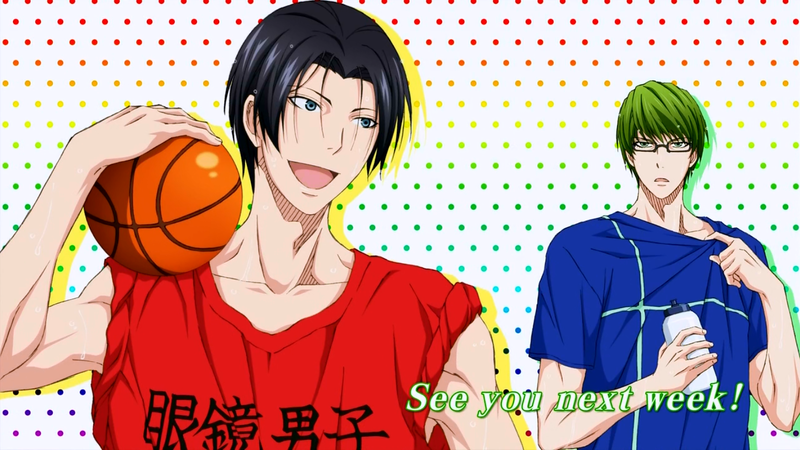 Takao: Hey, Shin-chan, where the heck are we going? Midorima: Be quiet and follow me. Takao: Alright, alright! Just let go of me, already! Midorima: [sighs] We’re here. This is the place. Midorima: This is the home of Seirin’s coach. Midorima: It was bound to happen; Scorpio is ranked last in today’s “Oha Asa” horoscope! Takao: …I guess I’m still feeling a little sluggish. Midorima: This is a matter of life and death. Takao: You’re making a big deal out of nothing! Nobody’s ever died because of a bad horoscope! Midorima: Just come with me! Takao: Wait, are you serious?! Hey, you can’t just leave me hanging like that! Riko: [on the other side of the door] Coming! [opens the door] Oh, morning! Midorima: Good morning. Did Kuroko explain our situation? Riko: Yep! I heard all about it. Midorima: In that case, I’d like to borrow the book as soon as possible. Riko: Heh. Hold on just a sec. Midorima: Money is no object. Riko: Huh? Why would—?! What makes you think I’d want money in exchange for letting a friend borrow a book?! Midorima: There isn’t a moment to lose! Takao: Sorry, please excuse him! He’s not used to asking people for help. Riko: Why don’t you come in, then? Takao: Thanks for having us. Riko: Pretty great, huh? I managed to collect the entire series! They’re even the premium editions. Takao: Are they really worth all the hype? Midorima: These books were never bestsellers, but they are highly sought after, and they continue to appreciate in value on the rare books market. Riko: It’s mostly because the series has some diehard fans. The cover illustrations are gorgeous, too! But apparently the artist doesn’t do many book illustrations, which is part of what makes them so rare! “Oha Asa” really knows how to throw some curveballs! Midorima: Hn… As a result, we had a serious problem on our hands. Takao: Mmhmm… Oh, this is the one you borrowed from Kuroko the other day. Riko: Yep, that’s Me, Her, and the Dog. “You and I are now neither human nor canine.” “We are now simply ‘ourselves’.” Those are the famous lines! Takao: That went straight over my head, but it seems really profound. Midorima: This is today’s lucky item for Scorpios: Me, the Dog, and the Ring. Riko: Two dogs, bound by a ring—their friendship is so inspirational! Riko: This is the third book: Me, the Ring, and the Glasses! The dogs from the previous books do battle with their arch enemy from the glasses faction! This book is a lot darker than the others. Takao: What the heck is a “glasses faction”…? Riko: I just love the peaceful atmosphere that comes in the wake of all the fighting! Midorima: This copy looks very worn. Riko: That’s because I’ve read it over and over again! Next is this one! Riko: That’s a spin-off. It’s not as good as the others. The dogs aren’t involved in the plot at all, and the main character has a very high-and-mighty attitude. Midorima: Me, the Dog, and the Snacks. Riko: That’s the fourth book. They started printing fewer copies with the release of that book, which made the books increase in rarity. Personally, I like this one, but it’s been criticized for being too convoluted. Midorima: Critics say the author’s lack of direction is apparent in the writing. Riko: The information included about snacks is incredibly detailed, which might make the book a bit hard to read. Takao: But I think this cover illustration might be my favorite of the bunch. Riko: Same here! I love the vibrant use of color! Takao: Um…so this one’s next? Me, Clairvoyance, and the Dog. That gives me absolutely no clue what it’s about…! Riko: That’s the fifth book. A noble-minded boy with special powers makes his debut. Midorima: He only appears final book, but he’s apparently the most popular character among fans. Riko: The disparity between his noble attitude and his eccentric behavior is what makes him so interesting! Takao: Wait, does that make him the dogs’ friend? Or their enemy? Midorima: At any rate, we would like to borrow the second book. Scorpio is ranked last today. In the worst-case scenario, his life could be in danger. Riko: Is it really that serious? Well, why don’t you read the book here for now? Midorima: You have my thanks. We’ll do just that. Takao, start reading. Takao: Huh?! You have to read your lucky items?! Midorima: No, not under normal circumstances, but Scorpio is ranked last. You must do absolutely everything in your power! Takao: You’ve gotta be kidding me! How am I supposed to understand the story if I start from the second book? Midorima: You ought to have read the first one when we borrowed it from Kuroko. Takao: Shin-chan, you’re so cruel! Riko: [laughing] Are you two always like this? Takao: Don’t laugh! Just save me, please! I’m gonna relapse if I have to read this thing! Riko: “Relapse”? …hmm. Speaking of which, Takao-kun, all of your numbers are lower than usual. Are you not feeling well? Takao: Well…I’m just getting over a bit of a cold. Riko: Are you getting enough sleep? Riko:That’s not good! You need to take better care of yourself. I’d rather not help one of our opponents, but…well, whatever. Go ahead and take off your socks. Riko: That’s right. [rolls up her sleeves] There’s a pressure point located on the sole of the foot. Let me show you. You’ll sleep like a log tonight! Riko: Then we move on to the tips of your toes… [massaging, very forcefully] …and focus the pressure on your big toe…! Takao: OUCH—! Ow, ow, ow, ow! That hurts! Riko: The pain is proof that it’s working. [continues] Just bear with it…! Takao: Gaaah—! …aaah? Actually, it’s starting to feel pretty good. Riko: I know, right? Relaxing your muscles will help you sleep better. Midorima: This is hardly the time! Stop lazing around and start reading the book! Midorima: It is now Sunday. Takao: Man, thanks to that, I’m feeling fit as a fiddle today! Midorima: It’s all because of your lucky item. Takao: You sure it’s not ‘cause of the foot massage? Midorima: No, it’s because of Me, the Dog, and the Ring. That explains why you’ve made a full recovery. Had we done nothing, you would’ve died. Takao: Yeah, I don’t think so. Midorima: …anyway, why are we at the park? Takao: Shin-chan, you saw “Oha Asa” this morning, right? Midorima: A relief, to be sure. Takao: …and Cancer is dead last. Midorima: …hmph. I came fully prepared. Takao: But they said, “Today’s lucky item is your rival!” How’re you gonna drum up a rival? Takao: Hm? They’re pictures. [flipping through the photos] Kise…Aomine…Murasakibara…Akashi. Wow, you’ve got the whole Generation of Miracles! Midorima: They’re all unedited photographs. Takao: Oh, here’s Kuroko and Kagami. And you’ve even got one of me, too! Midorima: Don’t get the wrong idea. The three of you are just extra insurance. Takao: We’re just backup, huh? Anyway, wouldn’t it be better to have the real thing instead of a bunch of photos? Midorima: What is that supposed to mean? Takao: Seirin’s gonna hold their practice here today. I thought we could join them. Midorima: How do you know that? Takao: Their coach told me yesterday. Midorima: When on earth did you…? Takao: Oh! It’s almost time to get started. Midorima: There is no way their coach would allow us to observe their practice. Takao: I texted her to ask, and she gave me the okay. Midorima: ?! You did what…? Takao: Apparently they’re not going to do their usual practice today; they’re gonna play cops and robbers instead. That’s why she said she didn’t mind if we came to watch. Midorima: By “cops and robbers”, you mean…tag? Takao: Yep, that’s right. Seems like they play every once in a while. Midorima: [walking away] I’ll pass. Takao: [grabs Midorima] Hey, not so fast! Midorima: …! Why should I have to play tag with the team from Seirin? Takao: Shin-chan! You went above and beyond for me when my horoscope was bad! Let me return the favor. Midorima: Takao, you are ten years too early to be worrying about me and my lucky items. Takao: Don’t be like that! Riko: Morning! Oh, Takao-kun! You’ve got some color back. Takao: All thanks to you! Kuroko: I didn’t expect you to enjoy playing cops and robbers, Midorima-kun. You must be quite attached to the game. Everyone was surprised. Midorima: …! [to Takao] W-why, you…! What on earth did you tell them? Takao: [to Midorima] Uhh… Don’t worry about it! [to everyone] Thanks for letting us join you! Riko: We can’t wait to get started! Kuroko: Everyone else should be here soon. Kagami-kun is very excited about having the chance to tag Midorima-kun. Riko: Let’s start by dividing up the teams. We’ll meet up under that tree over there. Takao: Roger that! [to Midorima] Let’s go! Takao: But your rivals are waiting for you! Midorima: Being around Kise or Aomine would be more effective. Takao: You know what my lucky item is today, don’t ya? Midorima: Today’s lucky item for Scorpios is…a dear friend. Midorima: What? Why are you giving me that teary-eyed look?! Takao: Shin-chan, just pretend you’re doing it for me! It’ll be like killing two birds with one stone! Midorima: …my fortunes…have truly hit rock bottom…! (1) Yanaka is an old-town shopping district in Tokyo, located near Ueno Park. (2) Charred gecko is used as a Chinese folk remedy for various ailments. (3) This is a spoof of the Japanese tokusatsu television show Space Sheriff Shaider. (4) A drinking bird is a bird-shaped toy heat engine that appears to “drink” water from a water source. (5) Mizaru, Iwazaru, and Kikazaru are the three wise monkeys who “see no evil, speak no evil, and hear no evil”. The name of the fourth monkey, Furimukazaru, means “don’t turn around” and implies “face no evil”. (6) 50,000 yen = ~ US $500. That was nice to read. Even if Midorima tries to hide it, he really does care about his friends. I liked the fact that he mentioned that it’d be better if they brought Kise and/or Aomine + the whole “dear friend” thing. The tsun was strong in this one, but the dere was worth it. Thank you so much !!!!! !~~~~ it made my day !!! :((((((( i ve read another translation of this drama cd on tumblr but there were some parts i didnt totally understand until i read yours ;;;;;; so arigatou gozaimasu !!!!!!!! Oh thank you so so much for this! This drama cd was truly amazing..The MidoTaka was really strong in this one. I love their relationship so much, and how considerate Midorima can be, especially towards Takao. The ending was so precious. Thank you as always for all your hard work!! Now, im waiting for 2nd season Vol. 2 Audio Drama Feat. Kagami Taiga! \(≧◇≦)/ !!! “I thought today’s lucky item for Cancers was a dozen pineapples.”. Thank you sooooooo much >_<!!!!!! I HAVE NEVER LISTENED TO ANYTHING SOOOOOOOO CUTE LIKE THIS BEFORE QVQQQQQQQ!!!!!!!!! Yeah, it’s funny how they snuck those references in there. I wonder if the “dog” (first book) is supposed to represent Kise? Grimm-san, I know it’s been awhile since you posted this, but can I use your translation in a video in youtube? A video with audio and translation? I’m planning to make one.. Not sure if it would be successful, though. Of Course, I’ll link it back here and will give credits to the owners. Anyways, thank you for this translation! They couldn’t be more cuter! I’d love to see the video when you’re finished! OMG this one was so cute!!!! That ending, ahh I ship them so hard hahaha. Thank you for translating! !